Nine of Amma’s (my maternal grandmother was fondly called as Amma by everyone who knew her) children and few of her fortunate grandchildren (including me) have spent their cradle years listening to this Kannada lullaby every night before being rocked into a sound sleep. Amma passed away last Sunday morning, after half a decade of battling the problems of aging. Amma was in her early nineties. Over the years, she had lost her memory, vision and strength, and had been confined to her bed and chair till her last day. Though our family has been bereaved of a loved one, it should be noted that Amma’s sufferings have come to an end. She didn’t deserve this phase in life where she had lost her independence and right to a life with dignity. My fond recollections of her, dates back to the time when I visited our village every year during the summer holidays. This was the time when there used to be plenty of cattle, hen, dogs and cats in our farm. Images of her walking in the farm with a fistful of grains and calling out to the hens and chickens, “Baa.. baa..” , never seem to fade from my memory. When it comes to Amma and my photography, I think I was quite late in picking up my camera. By the time I began to indulge in photojournalism and documentary photography, Amma had passed her graceful years and had slipped in to a life in oblivion. Couple of years back I visited Amma and Ajja’s (grandpa) home with a SLR camera loaded with a black and white film. I was seeing Amma after a longtime and she had shrunk in size by then. With her memory caught in a time warp, she had lost touch with day-to-day happenings. Her eyes were giving away too. She could barely make out who or what was in front of her. Sometimes she used to speak about her father and her childhood home. And she had expressed her desire to meet her father, who was no-more. It was heartbreaking to see her in such a situation. But even in this condition, her motherly instincts were still strong. If she was eating something, say a banana, and if she could make out a figure moving around in the room, she would promptly offer a piece of whatever was on the plate to the person in the room. Most of the times when left alone, she would get into a cycle of singing prayers. A prayer would be followed by her joining hands and bowing to the almighty. And this cycle would continue until somebody interrupted and diverted her attention. It was during one of those prayer sessions by the window, I stepped into the room with my camera. By then I had clicked portraits off Ajja and others in the house. But seeing Amma in the viewfinder, I somehow couldn’t shoot her picture. The face of Amma one has in their minds is from her healthier and jovial days. I was stuck in a dilemma. I began to wonder if it would be rude of me to document her in this state. But, I had to have Amma’s picture in my album. 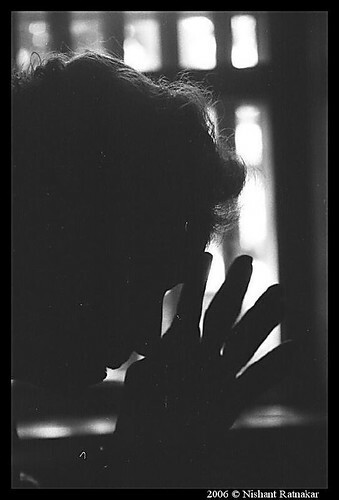 So, in that moment of dilemma I framed a silhouette of what Amma did the most in her later years…… pray. A prayer in her own world. This entry was posted in Homeland, People, Personal and tagged black and white photography, homeland, journal, kamalakshi dadu master, pangala, silhouette. may her soul rest in peace. amma is into deep sleep. i dont know when we will wake up. I never believed that I’d get touched by a photograph. This one changed my belief. Touched ! I wonder if I ever will think twice before shooting a photograph.. This is very beautiful. Makes me feel closer to my own grandmother. May amma’s soul rest in peace. very beautifully written ….my condolences…..
Great post and a lovely photograph. Nix, My condolences, I know how it feels. May her soul RIP. I know how you feel brother.. She was my amma too.. may her soul rest in peace.. Your picture speaks a million words. Beautiful post, really. Brought back memories of the time when my grandfather was going through something very much like this…It’s really sad to see your loved ones pass into a state that’s so different from what they were like earlier…Your picture speaks a million words.